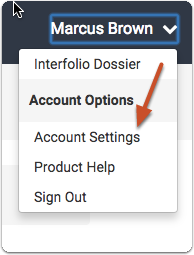 From the "Subscription & Billing" tab of the "Account Settings" page, you can download a ZIP file containing a folder with all data and non-confidential documents uploaded to your Interfolio account, along with a spreadsheet file recording all transactions you've made through Interfolio. You can also view your transaction history and download a record of individual transactions. 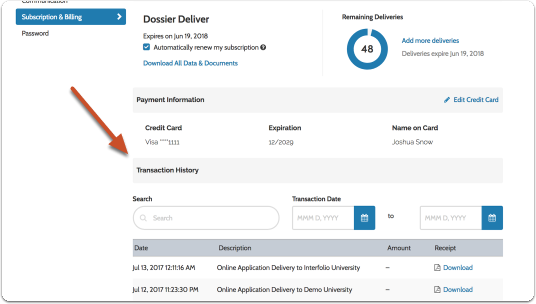 Select "Download All Data & Documents"
Selecting "Download All Data & Documents" will download a ZIP file containing a folder with all data and non-confidential documents uploaded to your Interfolio account, along with a spreadsheet file recording all transactions you've made through Interfolio. 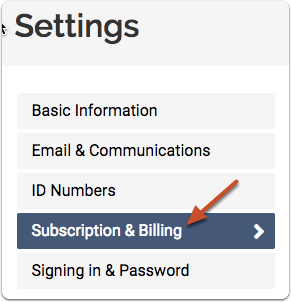 Scroll down the page bottom of the "Subscription & Billing" page and look for "Transaction History"
You can search or filter the list of transactions by date, or date range to make individual transactions easier to find.